The D-3 Digivice is based on the handheld devices from Digimon Adventure 02. Progressing through the areas requires you to take “steps” which are counted from a pendulum inside the toy. Keep it attached to your belt and as you walk (or shake it manually) the counter will decrease leading you to the end of the area. Digimon – You battle your Digimon throughout the Areas beating the enemy Digimon. None of Digimon has a default type; it changes based on battling and training. Vaccine = morning, Data = afternoon, and Virus = night. Detect – The D-3 has an antenna, which is used to seek out other D-3’s. The same antenna is used for the Digimon Help wave. Discover – With this Antenna, you discover Digimental by trying to detect one near an electronic signal (TV’s and Radio’s work well). You can use any Digimental on any Digimon without restrictions. In each version of the Digimon D-3, you have access to only two Digimon. Version 2 is Hawkmon/Tailmon and their evolutions. 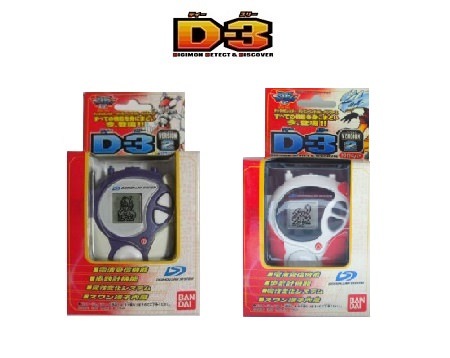 The D-3s allow you to connect to the D-Terminal, just like the Digivice allows you to connect to the Digimon Analyzer. In the D-3s you have the ability to Armor evolve as well as Jogress to evolve further. Progressing through the Area’s requires you to take ‘Steps’ which in turn is a mini pendulum clicking on the inside of the toy. Gather more Digimentals and Jogress to evolve into higher levels. Keep it attached to your belt and as you walk (or shake it manually) the counter will decrease leading you to the boss of the Area. Beat the bosses to progress in the game. Use current Digimon: Once this option is selected your Digimon will attack. After 3 attacks, or when someone’s Hit Points go down to zero – the battle is over (you lost if a skull appears). Evolve: It will allow you to Evolve the Digimon selected. You can only Evolve once per round. You can choose Normal Evolution or Armor evolution and then choose the specific. Quick Fight: If you select this option, the fight happens without any animation and then the results are announced. Digimental: Allows you to scroll through the Digimentals that you have. Training: Training costs 2 DP. Hikari (light) – Trains Vaccine/Data Type Digimon (shaking). Search: Does a 60-second search for electronic interference (Radio’s and TV’s are good sources. Press the A button when one is found to obtain a Digimental piece. Digimon: Battle with other Digimon Toys, Trade/Jogress with D-3. WonderSwan: Link with the WonderSwan games Tag Tamers and D-1 Tamers. Terminal: Link with the Digimon Terminal. Battle Score (Senseki): Displays your Win Ratio. Medical Treatment (Chiryou): Heals your Digimon when they are hurt so they can walk on the map. Press Once: Shows your active Digimon. Press the Right or Left Button to scroll and choose another. Normal: Displays attribute and stats of your Digimon, Press the A Button to scroll through or the Left or Right Button to view the stats of other Digimon. Digimental: Press the Right or Left Button to scroll through Digimentals, and the A Button to select one. Displays the Armor Digimon that evolves from the selected Digimon using the selected Digimental, shows stats and attribute for it. Press the A Button to scroll through, or the Left or Right to view the stats of different armor Digimon. Evolve (Shinka): Displays the evolved form of selected Digimon, and shows attribute and stats. Press the A Button to scroll through, or the Left or Right to view the stats of other evolved Digimon. Pressing the ‘B’ Button on the main screen: Shows map with three areas on it and your location. Press Once: Displays name of the area you are in. Press Twice: Displays how many steps to go before the area is cleared. Press Three times: Displays total number of steps taken. Valkyrimon (Jogress Silphymon with Garudamon on the Tag Tamers, or D-1 Tamers WonderSwan game) – HP: 14, AP: 3, Mega hit: 5, 23. Area 01: Pagumon, Betamon, Raremon, Kiwimon and Mojamon. Area 02: Raremon, Kiwimon, Mojamon, Meramon, and Hanumon. Area 03: Meramon, Hanumon, Kentarumon, Golemon, and Musyamon. 1. If you clear all Areas of 130,000 steps or less, the Boss Digimon and others will become available to join your party. 2. Digimentals can be gained through the methods described. 3. Adult Digimon can only be gained by getting 4 specific Digimentals. 4. Perfect Digimon requires a Jogress with another D-3 of the same version. 5. Ultimate Digimon requires a Jogress with specific Digimon from the WonderSwan games; Tag Tamers or D-1 Tamers. 6. The Secret Digimon appear randomly in the designated area.